Osaka is a major port on the eastern part of the Inland Sea of Japan, with the total of imports and exports running at eighty five million tonnes per annum. 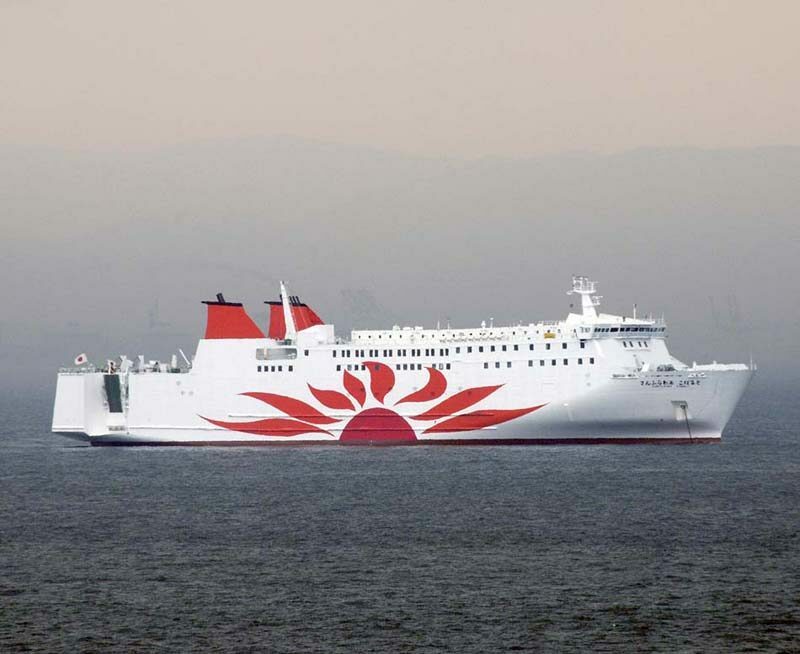 The Port of Kobe is only twenty kilometres west of the Port of Osaka, with the population of the metropolitan area of Osaka and Kobe at 21.6 million people. 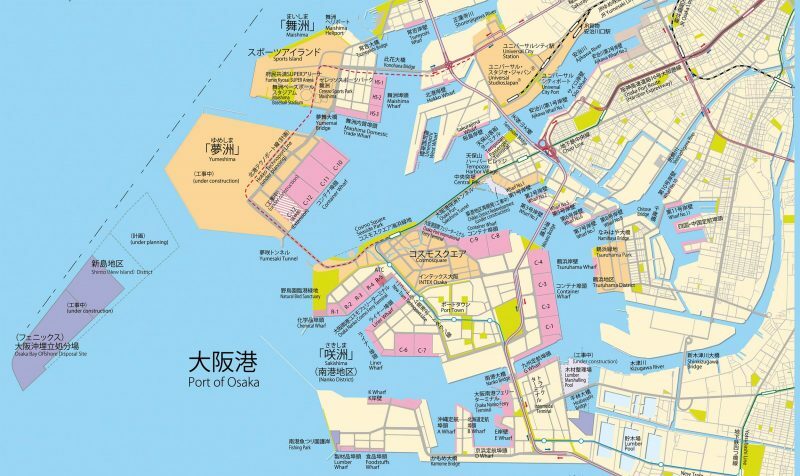 Osaka is in the centre of the Kinki plain, built on the delta of shallow Osaka Bay. The western shore of this almost enclosed eastern arm of the Inland Sea is formed by Awaji Island, and the northern and eastern shores are part of the Kansai metropolitan area. The Akashi Kaikyo suspension bridge links the north end of Awaji Island to Akashi on the mainland. A number of artificial islands have been reclaimed from the sea in Osaka Bay during the past decades, including Port Island, Rokko Island, and another island for Kansai International Airport, which together with Kobe Airport. Three hundred container ship routes emanate out of the Inland Sea of Japan with 2.2 million TEU of containers handled per annum at the Port of Osaka. This busy area of Osaka and Kobe is the second most important industrial area of Japan, after Tokyo and Yokohama. 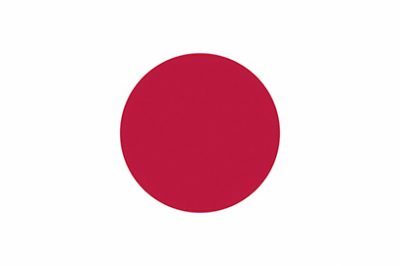 Japan, originally called Nihon, was created by volcanic upheavals, with 10% of the active volcanoes in the world in this country and 1,500 volcanic eruptions each year with the added threat of tsunamis for offshore eruptions. The flat topped active volcanic cone of Mount Fuji is 3,776 metres in height and last erupted in 1707, with no one able to predict the next eruption. One of Japan’s greatest painters, Katsushika Hokusai (1760-1849) painted Fujiyama from every conceivable angle, it lies to the east of Osaka and one hundred kilometres southwest of Tokyo. Nature is revered by Shintoism, with the active spirit world of the wind, waterfalls, the sun and other natural phenomena, and also in Zen Buddhist meditation and gardens with Bonsai trees, cherry blossom trees and harmony with nature. Shinto means ‘The Way of the Gods’ and existed in ancient times as a folk tradition centred around regional spirit cults. The Meiji Government, which came to power in 1868, brought Shinto under the sponsorship of the modernising State, not only using it in State rituals concerning the Emperor, but also bringing every temple in the country under the spiritual authority of the Japanese Emperor. Human habitation of the Osaka area first began in the ancient Jomon period from 14,000 BC to 500 BC, but it was one thousand years later in 500 AD that Osaka began to flourish as the political and economic centre of Japan. Naniwazu Port, the predecessor to the modern port of Osaka, became a gateway into ancient Japan for visitors from China, Korea and South East Asian countries. These visitors brought skills in ceramics, forging, and all manner of mathematics, sciences and engineering. The new religion of Zen Buddhism then began to spread across the whole country. Prince Shotoku constructed the Shitennoji Temple in Osaka in 593 A.D., and the city became a base for international exchange with the Asian continent. In 645 A.D., the Emperor Kotoku moved the capital from Asuka (Nara) to Osaka. He built the Naniwanomiya Palace, which is considered to be the oldest palace in Japan. The National Government later moved to Kyoto, then Nara, then back to Kyoto, but Osaka continued to act as a sub-capital, and to play a crucial role as a major gateway for foreign culture and trade. 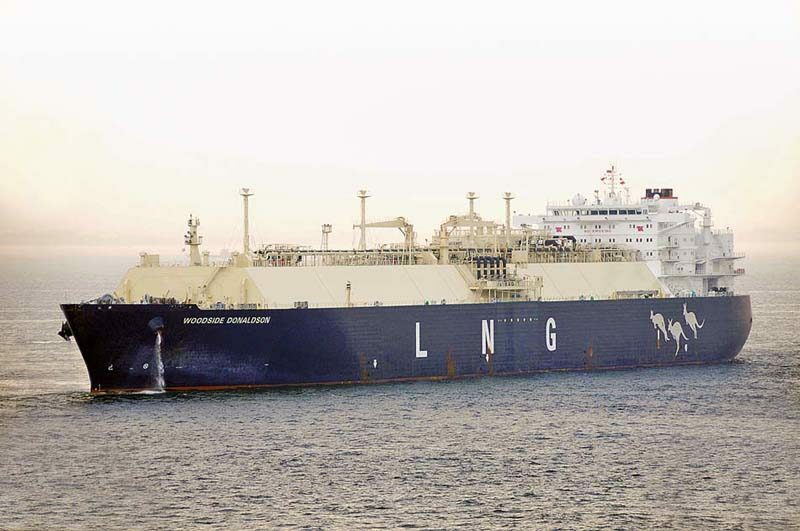 The 104,169gt LNG tanker Woodside Donaldson of Teekay Shipping at the entrance to the port of Osaka. She was built in 2009 by Samsung at Koje. In 794 A.D., the capital of Japan was moved to Kyoto and the Heian Period that followed saw the construction of numerous temples around the Osaka and Kyoto areas. The nation entered the Kamakura Period in the late 1100s, powerful warlords gained control over the land, and the capital was moved to Kamakura. After two centuries of civil war, Osaka had been devastated by turmoil, but in 1496, a high ranking priest called Rennyo, began to construct the Ishiyama Gobo, a temple with quarters for monks on the Uemachi Daichi Heights of Osaka. The area around the temple began to be called Osaka, and it became an impregnable fort to defend against warlord attacks. During the late Muromachi Period (1336-1573), Nobunaga Oda, a powerful warlord began to control Osaka from the Uemachi Daichi Heights, and because it had its own water supply from the Yamatogawa and Yodogawa rivers, it began to control the rest of Japan. However, the temple was destroyed after a decade of conflict, and control was transferred to Nobunaga Oda and then to his successor, Hideyoshi Toyotomi, who built Osaka Castle in 1583 during the Azuchi and Momoyama Periods (1574-1600). Rivers were excavated to expand the capabilities of Osaka as a base for a port. Osaka Castle was unfortunately burnt down during the turmoil between the winter of 1614 and the summer of 1615. Japan entered the Edo Period (1601-1867) with the capital moved from Kyoto to a fishing village to the east to become the city of Edo, which was rebranded as Tokyo on 13th September 1868. The Emperor of Japan pursued a policy of isolation from the rest of the world from his enclave in the centre of Tokyo. The Samurai warriors, Shogun rulers, art and print making prospered, but like everything else in Japan they were torn apart every twenty to thirty years by earthquakes. Osaka also grew into an economic powerhouse with the staple diet of rice arriving at Osaka from the Far Eastern world. Popular arts and culture as well as traditional performance arts e.g. the Joruri puppet theatre and progressive schooling was introduced. By the 1850s and 1860s, the first Western explorers began to arrive in Japan to move it out of isolation and into the modern age. The event which speeded up the pace of political change in Japan occurred in 1853 when Commodore Matthew Perry sailed into Uaga Bay near Edo (Tokyo) with a message from U.S. President Fillmore demanding trading rights with Japan. Japan emerged as a colonial power during the period from 1868 to 1912, and in 1894 rivalry for political influence in the Korean peninsula led to outright war between Japan and China, with Japan the victor much to the surprise of both China and many Western Powers. Japan annihilated the Russian fleet in 1904 in the Straits of Tsushima, with Japan also left firmly in control of Korea, which was made a Japanese protectorate under the terms of the Treaty of New Hampshire of 1905. Five years later, Japan annexed Korea. Osaka declined in importance after the moving of the capital to Tokyo in 1868, and Osaka moved to become a commercial city and port, the year of 1868 taken as the founding of the port. Osaka was officially incorporated as a city in 1889, and in 1903 the 5th National Industrial Exposition was held in Osaka. The population of Osaka began to grow and during World War I, Japan was on the side of the Allies, and the Treaty of Versailles of 1919, concluded after the German surrender in 1918, gave Japan an expanded empire with a mandate over a group of Pacific islands, formerly German colonies. In 1925, Osaka was the largest city in Japan. During World War II, the attack on Pearl Harbour was avenged by the U.S.A. after it fought its way across the Pacific island by island. At Okinawa, they were faced by a fanatical aggressor prepared to defend the approaches to the four main islands of Japan. Massive American losses in Army troops were predicted, and the American leadership chose the nuclear option to force the fanatical enemy into surrender. After the radioactive dust had settled, Osaka had also been levelled by American ‘Super Fortress’ bombers, losing one third of the city. Osaka had no option to rebuild the shattered city, and in 1951 it was designated as a major port. By 1970, it was host to the First Expo Exposition held in Asia. The Osaka International Convention Centre and the Tempozan Cruise Centre have restored Osaka to a position of international importance.